Drum line, Thunder and Cheer Team in stunt mode amid the runner-up Game Day performance. 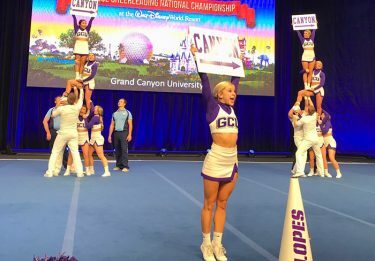 The standing ovation said it all: The Cheer team from Grand Canyon University performed a flawless routine in the Open Co-ed Game Day event at nationals. 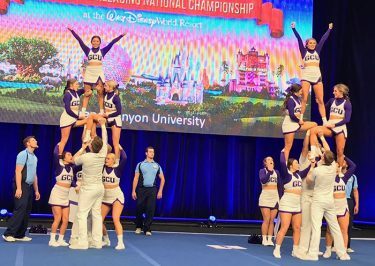 That effort placed the Lopes in first place heading into the finals, where one slight error produced a runner-up finish, the best in GCU Cheer history. The Cheer team also competed in the small Co-ed Division I event, placing eighth. 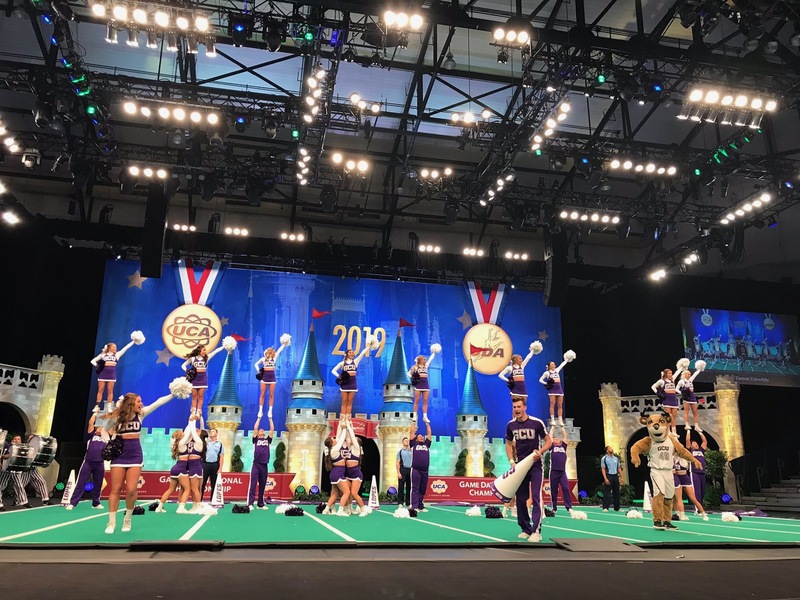 Both events took place Friday and Saturday in the Cheerleading and Dance Team National Championships at Orlando, Fla., conducted by the UCA (Universal Cheer Association) and UDA (Universal Dance Association) at the ESPN Wide World of Sports Complex. As Stephens and associate coach Keegan Hubbard predicted, GCU was able to transfer its incredible pregame and in-game atmosphere from athletic events on campus, especially basketball games, to the stage in Florida. The mixture of moves with Thunder and music, including the seven-person drum line, under the guidance of Band Director Paul Koch, was unique. It included stunts in the sideline aspect, stunts, basket tosses and pyramids in the timeout and synchronized moves to the invigorating fight song. Stephens noted that it is unusual for the Cheer team, the ultimate supporters of all athletic teams, to be in the competitive role that simultaneously shows a supportive culture. 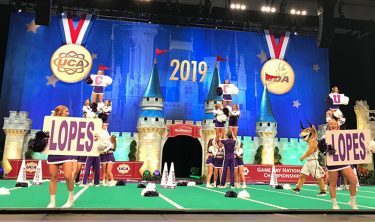 The Cheer team showed elite skills in the small Co-Ed Division finals. All of the rehearsal and strength and conditioning practices, averaging 20 hours per week for the past nine months, came down to a three-minute routine in the Game Day event. “You have three minutes to do it perfect. The pressure is insane,’’ Stephens said. The other event, small co-ed Division I, includes a rigorous set of required elements for the first 150 seconds. The senior from Anthem also was thrilled by the runner-up effort in Game Day and the standing ovation of the crowd. Traut and the other seniors gathered the team before each performance with a focus message. 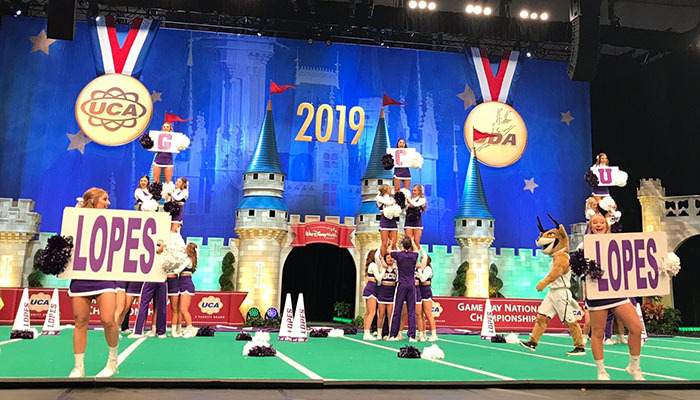 The Cheer team earned runner-up honors in Game Day competition. As the business management major with a minor in communications hustled off to her 9 a.m. class on Monday, she summed up the weekend.